Combine the lime juice and honey in a small jar with a tight-fitting lid and shake vigorously to dissolve the honey. Add the water and fish sauce and stir to combine. Taste for seasoning, adding more fish sauce or honey if necessary. 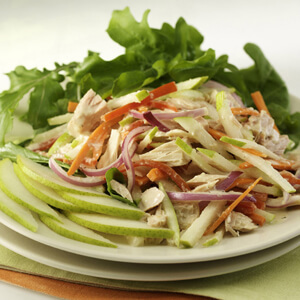 In a large bowl, combine the shredded chicken, cabbage, carrot, and scallions with about half of the dressing and toss gently to combine. Spiralize the pears at the last moment to prevent discoloration, and add them to the salad along with the cilantro and basil. Toss the salad gently once again to combine. Taste for seasoning, adding more dressing if desired. 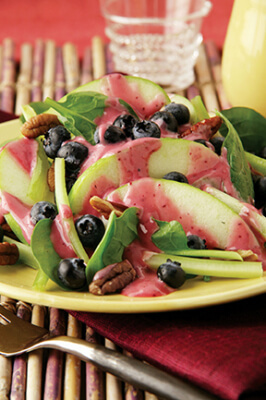 Transfer the salad to a large platter or bowl and top with the chopped peanuts.